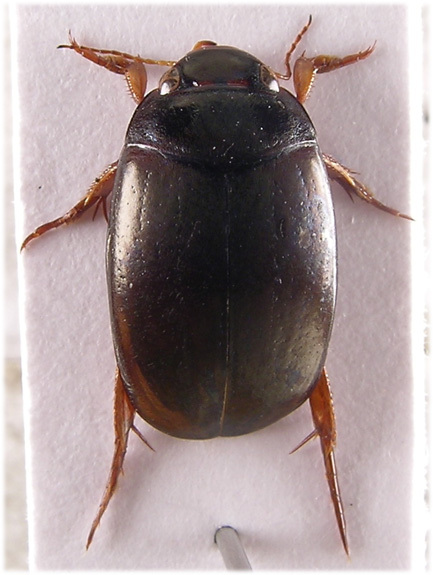 Female One of our most common and widely distributed water beetles; Balfour-Browne states ' there are few divisions in the British Isles whence it has not been recorded, and it is safe to assume that it actually occurs in all of them.' The NBN distribution map reflects this with records from the Scilly Isles, Lundy, Man, the Highlands, Western isles, Orkneys and Shetland. Nilson and Holman ¹ state that it occurs in all types of water body; above the tree line in shallow lakes with stoney or silty bottoms, in the boreal region from small bodies of running water, springs and ponds with little vegtation and in various ponds generally. In the UK found in almost every type of wetland habitat including peat bogs and brackish environments (Balfour-Browne), it is virtually always present in marsh and detritus ponds and is quick to colonise new environments; they are (or were a few years ago when such things were common locally) invariably found in cattle troughs, garden ponds and temporary environments e.g. during the spring, water filled wheel ruts in the New forest commonly contained them during the 1970's and 80's. Wetland habitats that dry out during the summer are worth searching as the beetles often remain in cracks in the soil, among damp vegetation or under debris ². Weed choked ponds, lakes and gravel pit margins and slow stretches of rivers along the Colne valley from Cowley (Middx) to Watford host the species with often large populations occuring in small, stagnant ponds. They are strong fliers and attracted to light; we have recorded them from M.V. on Croxley moor and in whippendell wood through the spring and early summer. Jackson ² states that fully developed flight muscles are present in specimens examined from all times of the year. 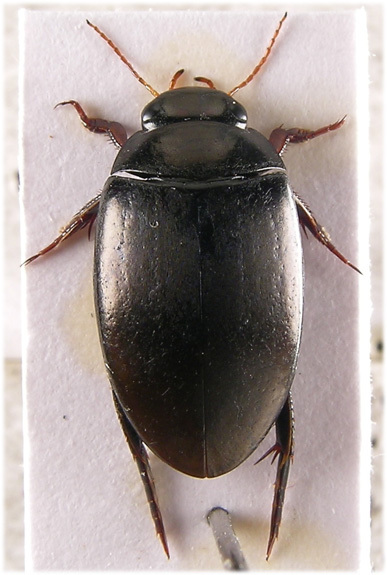 The species has a long breeding season, Balfour-Browne recorded freshly emerged specimens in each month from may to september and larvae of all stages throughout the year. Nilson and Holman ¹ states that adults and larvae occur throughout the year. 9.5-11mm. Elongate oval and somewhat depressed, especially apically, continuous in outline or weakly constricted at pronotal/elytral outline (specimens from high altitude/latitude often have the pronotum narrowed posteriorly so the outline is distinctly angulate ¹). With a little experience the general form and colour make this species obvious in the field. Entirely black (or, rarely, with red elytra Friday) but for antennae and palpi clear rufous and legs to some extent red. 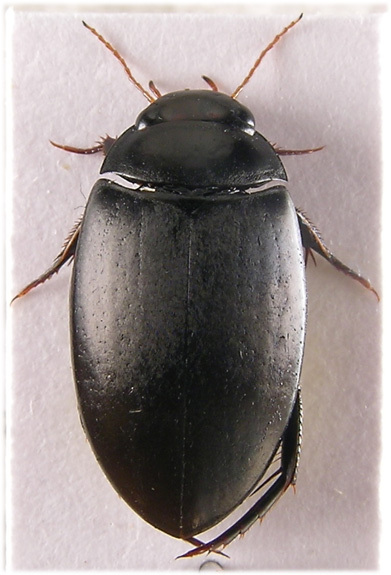 Female dull, male shiny, usually with a bronze lustre. 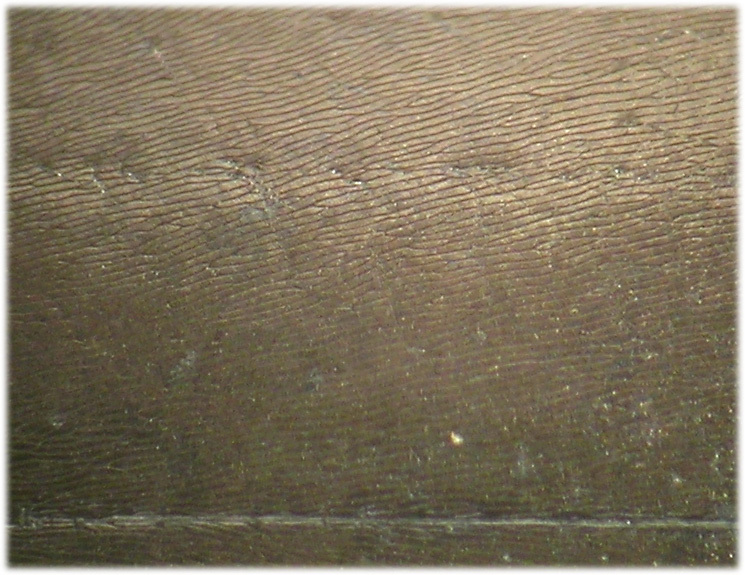 Apical part of terminal segment of antennae and palpi black. Antennae filiform, without any thickened segments. Front margin of eyes notched. Frons impressed either side at the level of the antennal insertions, these depressions may form weak oblique furrows to lateral margin. Inside margin of eyes with obscurely punctate and rugose furrows. Vertex with two, often obscure, red spots. Pronotum strongly transverse with front angles produced and acute, bordered anteriorly and laterally and strongly sinuate basally. Finely punctate behind front margin, very finely and sparsely punctate along base, often present only towards sides. Elytra strongly bordered, these borders not entirely visible from above, with two rows of randomly arranged setiferous punctures and others in between, these become confused apically. With finely impressed 'web' of lines, more developed in male, the transverse of which are fairly obvious when illuminated from in front, absent towards base and coarser apically. Entire pronotum and elytra with well developed elongate (up to 6X longer than wide) microsculpture ³ which becomes obvious with a X10 hand lens in good light, denser, more deeply impressed and not so regularly elongate at sides of pronotum and apex of elytra. Head also microsculptured but not so regularly elongate or longitudinal. Upper surface of female microgranulate except for front of head so appearing dull, in the male this is much weaker and confined to the elytra or barely suggested on the pronotum (X40). Apex of profemur, tibia and tarsi red. Protibia with lateral spines and strong terminal spurs. Male protarsal segments 1-3 dilated, anterior claw shorter (2/3) than posterior and toothed at base, posterior claw dilated (view from side). Female protarsal segments not dilated, claws smaller, subequal and not modified. Mesotibiae with lateral spines and long terminal spurs, claws in male unequal; anterior shorter, posterior dilated. Subequal and much smaller in female. Posterior femur with a short series of small spines near apex of posterior margin, visible from side. Upper surface of meso and meta tibiae and tarsi with fine long swimming hairs, these are usually recumbent and not obvious. ¹ Nilson, A. and Holmen, M. 1995. 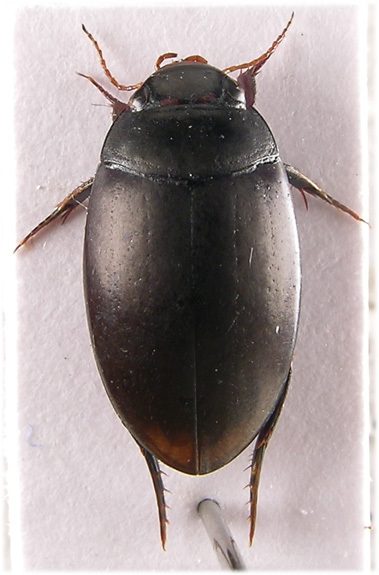 The aquatic adephaga of Fennoscandia and Denmark II Dytiscidae. Fauna Entomologica Scandinavia. 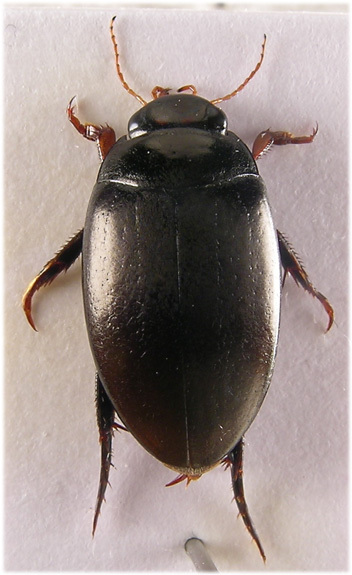 ³ Agabus striolatus (Gyll.) also has elongate microsculpture but is smaller, 7.0-7.5mm, and parallel sided.